Whit Smith was born in Greenwich, Connecticut and spent his earliest years in New Cannan, Connecticut and later Wellfleet, Massachussetts. Born to musical parents Whit was exposed right away to a life of practicing and performing. Says Smith, “My mom and dad used to sing and play folk music every night after my dad got home from work. Every weekend my dad would spend hours sitting in front of the record player figuring out rural blues tunes by Robert Johnson and Mississippi John Hurt. Then for a couple of years he was really big on Manitas De Plata and flamenco guitar. I still have his old records with all the notes and diagrams he drew out for himself.” By his early twenties, Smith had moved to New York City, where he went on to spend the next fifteen years and his most formative years in music. Though originally self-taught on the guitar, by the time he was a teenager Smith had realized the advantages to taking lessons. He began studying with numerous teachers including guitarist Bill Connors who had been playing with Chic Corea, and, for a time, studied Classical piano in Wellfleet with Dowell Multer who first introduced him to the rigors of harmony, melody, and chordal voicings. Beginning in 1992 Whit studied for two years in New York City with veteran New York guitarist Richard Lieberson focusing on American guitar styles from traditional jazz forms to Western and pre-1970s country. He would apply these lessons as quickly as he learned them at his weekly shows in New York City. In 1994 Smith started The Western Caravan, a thirteen-piece Western Swing orchestra, which continues to play to this day, everything from hoedowns to country to jazzy arrangements with triple fiddles and steel guitar. 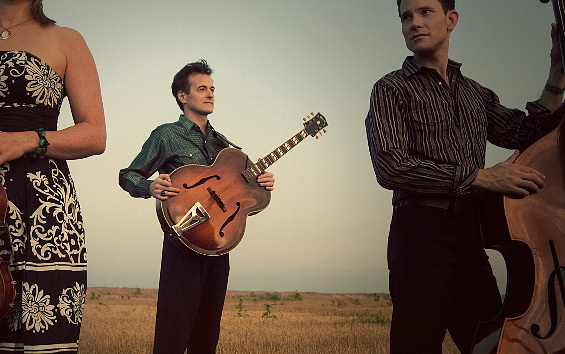 It was during this time that Smith met violinist Elana James, through an ad in the music section of the Village Voice, and ultimately began the band Hot Club of Cowtown with James, which has been his passion and chief focus since the group released its first recordings in 1998.